So yesterday, I was dressed in my riding clothes before Jens even awoke. When he headed out to work, I went with so he could drop Loke and I off at the storage. 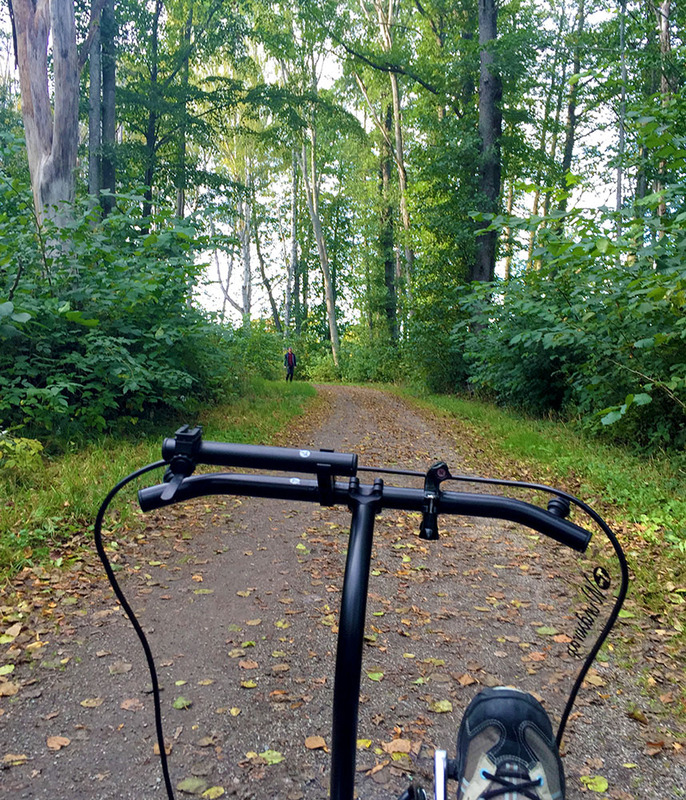 The plan was to get a short loop for Loke, wait at home until about 9:30 upon which I would head out solo to the edge of Uppsala to hit the largest cycle shop and sporting goods in the city. The trailer hitched in case I picked up something that wouldn’t fit in my pannier bags, we rolled out. I must say, the weather the past few days, maybe even a whole week has been gorgeous. The mornings especially as proven by the photos in my previous post. And yesterday morning was no exception. It was about 42 F. I had light wool under my leggings and top. While at the garage to get ready, I also pulled on my heavier wool shirt. Wool glove liners went on as well as the thin knit cap under the helmet. Still wary about the efficiency of the fairing, I also debated using my old shoe covers, cracks and all. I decided not. It was just a short loop to the apartment to start with. Loke was raring to go in the brisk autumn air and I was in a mood to let him stretch his legs a bit. For some time now, the old, well-worn path of the River Loop has had some complications. Along one road where the path goes, work has been on going to install a couple of round-abouts at intersections. Where I usually scoot across the off-ramp of the 55 has been closed for the past few weeks. That’s meant heading back to the bridge to hug the river. Yesterday, the whole section was closed off so I couldn’t even do the mini-loop there. That snicked off about a mile and a half of what I’d planned for Loke. I figured it wouldn’t be the end of the world. I’d ride to do the errands and then come back to give him an extra run. So, the first part of my plan went flawlessly with the tiniest bit short of 3 miles as we rolled to a stop. As for the second part of it, Loke had other very determined ideas. I tried to relax for about 45 minutes. The furball was a coiled spring of tension. Every time I so much as blinked, he’d lurch wildly to his feet and scramble for the door. About half an hour in, he started giving those bossy little woofs and stomping his feet. Finally, he even came over and pawed at me as if to drag me to the door. Clearly, leaving him was out of the question. He probably would have brought the apartment down if I tried. No help for it. He would simply have to come along and languish with the trike as I ran into whatever shops we stopped at. That necessity added about a mile as it meant looping back to the storage for me to grab the cable. I really didn’t want to risk Loke chewing himself free and running rampant through traffic while I was in a store. I don’t think he would. He’s mellowed enough that most of the time he seems content to wait or maybe he just doesn’t want to leave the trike behind. So off we went through the heart of Uppsala. The route through the city has adapted a bit. I discovered connections that let me following along the rail line through the city to the underpass beneath the station and onward. It’s a bit more direct and a lot less confusing. The rest of the way went smoothly. Loke ran well, I felt fairly strong and the fairing had been keeping my feet from feeling chilled quite satisfactorily. We rolled by the pretty, long skinny park and I warmed up enough to pull off the heavy wool top, pitching it in the otherwise empty trailer. I noticed then that the trees were showing a bit more color, which was delightful. We continued to the edges of the city staying mainly on the little cycle roads that meandered on their own little ways away from the main roads. Finally, we were rolling under the old E4 to come up on the shopping complex with the cycle shop. Loke signed at me as I secured him and the trike. First I went into the HemTex (home textiles). I wanted to find a very cheap fleece throw to convert into a cover for my fairing. The ones they had were unsuitable and a bit too pricey. I also asked about flannel sheets. They hadn’t arrived yet, but within a couple weeks. I spent about 5 minutes, maybe as much as 10, chatting with the young woman. She was working alone, it was quiet and so, I think she was bored. We talked about the weather differences between where I was from and here, both of us laughing at how she thought Mississippi sounded dreamy and I was thrilled with the seasons of Sweden, cold and all. A couple other potential customers came in so I bid her goodbye. Loke stood up hopefully as I walked toward him and the trike and plopped his tail back down when I went on past into the cycle shop. Studded tires immediately to the left of the entrance caught my eye, reminding me that I needed new ones for the front. The tread is fine on my old ones, but the studs are worn quite smooth and low. I want ones that will bite into whatever ice I come across, especially if Loke’s determined to run. He can pull the trike around and drag it sideways if I lose traction. One of the guys came over to help. They had one 20 inch studded tire. Like at HemTex, they’ll be getting their full winter stock in a couple weeks. That also meant their selection of shoe covers was limited. The one that interested me was not, ever, going to fit over my chunky Shimano touring shoe. Even the ones that didn’t interest me would never have accommodated what I wore. That’s the problem with most shoe covers. They’re made, almost exclusively, for skinny little road shoes. Even the ones I’ve been using the past few years are like a size 45 to go over a 38 shoe and it’s a tight fit. I may just have to slap duck tape over the cracks and see how many more years I can get out of them until I can find another identical pair. Loke was impatient and raring to go as I emerged. Between the little morning loop and riding to the shop, we had probably almost 10 miles under wheels and paws, but he still had energy to burn. We had one more stop to make though. I wanted to take a peek at the big sporting goods store a couple roads over. I also stopped at a smaller one in the same complex where the bigger one is. They had a small bike section, but absolutely no shoe covers. At XXL, I darted in, doing a quick sweep through the clothing section to see if there were any non-black tights to grab. Gotta stay on top of that. Then I rushed to the bike area to glance at the tires and shoe covers. They had very few tires, only large studded ones and no shoe covers. Their cycle section is being overtaken by ski gear for winter actually. As I emerged from the store to start hitching Loke back to the trike, a woman with a toddler filled stroller and small infant in a chest carrier drifted closer, obviously waiting for someone. She said Loke was such a pretty dog. I thanked her and when she heard my accent, she started talking in English. We actually had a long chat. I was more than happy to talk about Loke and dogs in general. She was impressed that he seemed so focused on me. Her meetings with previous huskies had given her the impression that they’re not really a people-centric breed, more interested in their surroundings and what they can do to amuse themselves than people. I assured her Loke was often like that, but he also knows the trike won’t move without me and he wanted it to move. Hence, he was focused on me. With us on good terms, I stepped close enough to pull back the edge of the knitted carrier and take a peek at the little cherub’s face as she slept, snuggled against her mom. She was a cutie. 9 months old. Then she woke up. Her mom asked if it was okay to meet Loke. Much to my chagrin, Loke was a bit rude. Generally with people, little ones too, he might give them a quick sniff, grace them with a lick and then ignore them. He was utterly fascinated with that baby. Then he started kissing her. Loke’s kisses aren’t licks with a soft tongue. No, he just rams his nose right in. Huge, honking husky nose smooshing into that little face. He didn’t hurt her, but it did startle her into a bit of a fuss. Not that I blame her. I was stunned. He’s never done that to anyone else. The only people he’s ever done ‘kiss’ with are Jens and I. The only thing I can figure is she maybe smelled of milk and he hoped that if he did his ‘kiss’, she’d give him a treat. The mother quickly checked she was okay, then saw she was fine and laughed. In seconds that little angel was all smiles and gurgles, giving me adorable grins. Then the person the woman was waiting on emerged and we parted ways. I’ve done rides out to that area 3 times previously and the route I established for a loop gives Loke and I about 12 miles. We meandered down the cycle way set back off the big, busy road until coming to the under pass. Immediately out of the tunnel beneath the roadway, my loop goes right. I stopped at the juncture. It was a lovely day. The weather had warmed without getting too warm. The sky was mostly blue except for a few thin misty patches of clouds. Hardly any wind at all. It was too pretty to go back to the apartment so early. Not to mention, it had seemed the trees were more colorful and I knew a lovely stretch of road that I’ve not ridden down in years. I completely surprised Loke by going left. Rolling along side the road, I thought of something that almost turned me back. This addition might as much as double the originally intended distance and I had packed no water for the fuzzy, or myself for that matter. Fortunately, along the way to the ‘magic country lane’, there was a small grocery. I stopped and ran in to shop some water and something for Loke to drink from. He only took a few licks, but I was glad for the water even if he had been fairly indifferent. A bit blurry, but it’s autumn colors! As I left the store, there was a bit of confusion. I knew there was a series of cycle ways that would take me through quieter areas to the road I wanted, but the tangle turned into such a confused muddle, I gave up and followed along the main road again. Soon I was rolling by the familiar pastures and dog pens that told me I was close. I took a moment to give Loke a hug in a fit of nostalgia while rolling by the agility training pen. From the first days since we brought him home at 8 weeks old, we often went there to play and train with him off leash. Several times a week actually, until he started running with the trike. I was close, but not quite sure which turn I needed as I came to another intersection. A boy had been rolling back and forth along the sidewalk/cycle way on a scooter. He abruptly approached as I fiddled with the Garmin to figure out which way I needed. It was the ‘Thor and Loki’ that did it. His entire face lit up. “Loki! Like from the Avengers movie!” I had to laugh. Thank you, Hollywood for bringing the comic book version of an ancient pagan god to mainstream world awareness. He was also completely amazed that Loke was 10 years old, as old as he was. The river with a hint of autumn’s gold! He was a nice kid. A bit lonely, I think, being so far from the place he’d been born and so recently. The language barrier certainly complicates making friends in his age group, but his Swedish does seem to be coming along a pace if he’s been here for less than a month. I said it had been nice to meet him and rolled on. I’ve not often ridden the road I sought, perhaps this was the 4th time, but every trip has been a treat. Soft rolling hills as it follows the edge of a pasture land beside the river. Makes for beautiful scenery with the shimmering water and wall of trees on the opposite side. Some of them were indeed cladding themselves in autumn hues! As I rolled along, I realized I was in a good mood. Almost giddy as a matter of fact. The golden light, the colors of autumn, mostly shy, but with a bold splash here or there. Perfect temperature and just out in the middle of it all. How could I have been otherwise? The only grumble I had about the whole thing is that because the whole thing had happened so spontaneously, I’d not brought my proper camera. The iPhone wasn’t doing too bad a job with most of the photos, but I still itched to see what my Canon would have done. The road is barely over 2 miles, but what beautiful 2 miles! Too soon it was over and I was making the turn onto a busier stretch. Right near the little, single lane drawbridge across the river, a digger was tearing a up a lot of ground, making a mess of what used to be parking for the nature reserve. I’m not sure what they’re doing, but it looked fairly large. Maybe replacing the bridge with one wide enough to accommodate 2 lanes of traffic? The busy-ness of the roadside cycle way and closeness of the cars almost made me long to turn back and go back and forth a few times on the ‘magic road’. I resisted. A small gravel road opened up in the trees to the right and I rolled to a stop to stare down the shady tunnel of green and gold. I knew exactly where it led. I’ve taken that way once. I remembered with fond longing. It was back in 2006 during one of the first few rides with my then-brand-new Trice QNT. The reason it had only been one time was because deeper in, hidden by the trees and curve of the dirt lane was a very steep and fairly long climb. I’d been unable to pedal up, needing to get up and push the trike for several hundred yards. It had been difficult and unpleasant. The other side of that climb had been wonderful though. It was the southern portion of the same river side path I take every time I pass through the hospital area. 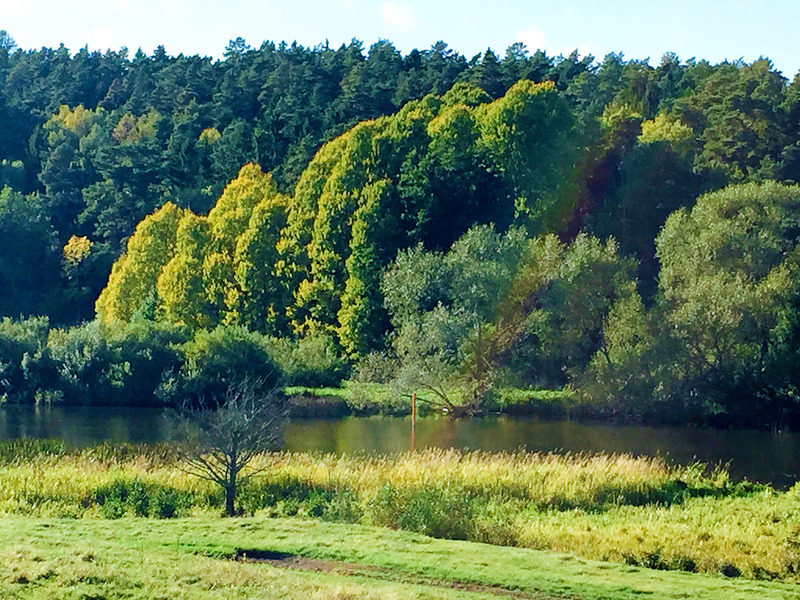 That path would take me almost to my front door, all along the river through wood land, fields and parks before fetching up along the channeled banks through downtown Uppsala itself. That climb had stopped me from going that way again the other few times I’d been in the area. I was always too tired after having pedaled there to face pushing the trike up that evil hill standing like a guardian to paradise beyond. Again, I almost didn’t do because of that harsh climb. Admittedly, I’m stronger than I was way back in 2006 and my Sprint has lower gear inches than my Trice, but I was pretty tired and dragging a trailer. Mostly empty or not that 14 lbs with the addition of a half liter of water and wool thermal top had an impact on my legs over the miles and would be felt going up. I winced as I turned away, but then stopped again as I faced the traffic choked road, both sides crowded with houses and businesses. Not terribly inspiring even with a safe cycle way beside it. Muttering that I was going to regret it, I turned to tackle that hill. It was as steep as I remembered, but miraculously, I actually made it up. Not easily and the tire slipped quite a bit. Loke was no help. Yet, I crept to the crown and paused to catch my breath in triumph, without needing to get up and push. Naturally with an older husky beside me, I didn’t get to plunge wildly down the other side like the first time I’d ridden here, but I didn’t care. I was happy. Loke loved it too and it was the first time he’d been down the path having been too young back in 2006 to run beside the trike. He adores woodland lanes and unpaved ones are even better. We came down the ridge to where the path fetched up against the river side and headed north. Was riding over there about half an hour earlier! Okay, so maybe it got knocked a little crooked. It was as wonderful as I remembered from 9 years previous. It was also fun to look across the gently rippling water to see where I’d been rolling through just a short time before. It was beautiful scenery too. I was snapping photos with my iPhone like a mad woman even if I did continue to mutter about not having my Canon. The addition to the ride was so spur of the moment. I wasn’t the only one out to enjoy the day and the river path. Many people were out walking, many with dogs. Also quite a lot of cyclists, most of them were on mountain bikes. It turns out the reason there were so many mountain bikes is that there was a fair sized ridge to the right side of the path that was crisscrossed with mountain bike paths. Not foot paths that just happened to be used by mountain bikers, but honest-to-goodness trails marked specifically for those people who thrill with every jolt and leap over rock and root as they plummet down steep slopes. I even texted Jens about it so I wouldn’t forget to tell him. I spotted a sign at one point right at the river’s edge and got up to read it. It was something about an old windbreak there, but couldn’t quite puzzle it out exactly. It was also a spot where a couple of guys were fishing with cane poles. One of them made a catch right then. Such a might fish emerged fighting the hook and struggling as it was lifted from the water. It was a whole… 3 inches long! I’m being generous with that estimate. A minnow really. A short distance from the guys feeding minnows, I realized that I’d strayed away from the river and was actually rolling in the opposite direction of the city. That I definitely didn’t remember. I pulled over to the edge where Loke could amuse himself by sniffing, dragging us along by inches while I puzzled out what was going on using the Garmin’s map. I love the water, can you tell? There apparently was a road that followed along the river, but I’d somehow lost it. The path I was on had cut west toward a small lake to curve around the south edge of it before following back up north where it would rejoin the river’s edge again. About a mile more distance. Unsure of how I missed what I thought would be the ‘main’ road, it didn’t really matter. The scenery was pretty, Loke and I still had energy and water. Onward we’d go. The land around the lake, particularly between it and the river was quite marshy. Not surprising given that at some point in the past it was very likely part of the river itself. Here and there, a break in the trees was the start/end of a plank walk through the open sunshine across the wetland grasses. The northern end of the lake and beyond cleared into an open wetland area. The path was on the edge of the marsh at the bottom of a gentle slope. I’d forgotten that path went through so many different landscapes just over a 4 mile stretch. Soon enough we were back along the river proper, the path lined with old trees like those that flank the little lanes leading to manor houses out in the country. There were fields and a generous helping of unexpected autumn colors. Actually, it was the most colorful portion of the ride and I couldn’t stop smiling… or clicking. 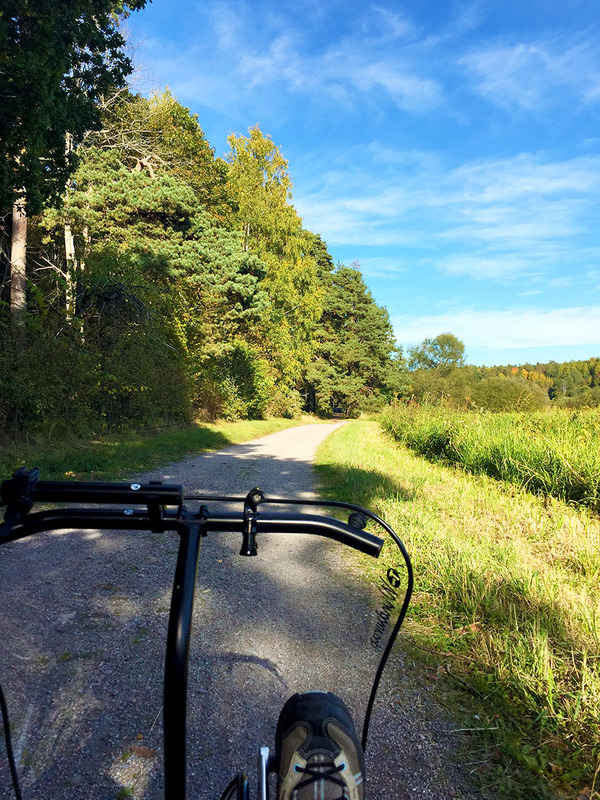 Much as I had loved the extra miles I’d added to what was supposed to be an errand run of 12-ish miles, I was only too glad when the trike crossed the threshold between the ‘only rode it once’ portion of the trail onto ‘been here hundreds of times’ part. It meant I knew there was just 4 more miles before I’d reach home and be able to flop down into a seat that didn’t move. I was wiped from dragging that extra 14 pounds of trailer. Even Loke was starting to get a bit draggy and I don’t mean in the ‘husky pulling a sled’ way. I slowed way down to let Loke stop often to sniff around in the grass or meander step by step as he explored what was probably the scent of a recently passing dog. It was coming up on 4 pm, but that was no reason to suddenly turn things into a big rush. Additional offers of water received only a brief glance before he waited for me to move on. When we were past the bandy court and rolling across our old friend, the pedestrian/bike drawbridge over the river, I counted it as the home stretch. I think Loke did too, because he stepped up his pace. We clipped along the riverside through downtown. As we rode next to outdoor seating for one of the cafes, a man called out in delight at the sight of Loke and put his hand over the low barricade to let his fingers brush his fur as we passed. Then we were home. Loke flung himself down and wallowed in the grass as I locked the trike up. Once in the apartment, he gulped water and then flopped down in the floor for a nap. I watched the clock, waiting for Jens to get home. I was ravenous. All I’d had to eat was a slice of toast smeared with cashew nut butter and a glass of juice. That had been around 9 am. It was after 5 pm and there wasn’t anything in the house. I also still had to get the trike back to the storage. The hubby was home about 40 minutes later. The content husky playing the part of a rug, jumped up and had all the energy in the world. It was as if we’d not covered over 23 miles, finishing the last 20 of that less than an hour before. I staggered out the door, Loke beside as Jens insisted, to get the trike put away. It was getting dark by that time, so I took a few minutes to put on my lights. Thankfully, it’s only a half-mile to where we keep the trike now. Loke was ready to go. He tried to run. Only the fact that it’s a 2% grade and I was too tired to help kept him from going faster than 8 mph. Shocking. 10 year old husky acting like that. By the time we hit the park to roll through to where Jens was already waiting, he actually started to flag. Naughty me wanted his help for that last 200 yards. ‘Loke, where’s Jens?’ I said. Suddenly we were in warp drive, Loke pounding pine-needles and packed earth like he was crazed 3 year old furball. After that, I still had to shop dinner. At least Jens drove me there. I rewarded myself with a nice cut of high quality steak. I avoid red meat most days of the week, so it’s become a treat. I had steak and potatoes in the form of a Swedish version of hashbrown patties that is eaten with lingon berries. I love them almost as much as mashed potatoes and it’s heart healthy as it lacks sour cream and butter. I was soooo hungry though that I also made myself a starter while the oven heated for the potatoes. Sugar snap peas sauteed in sesame oil and drizzled with a bit of soy sauce. Quite satisfactory a supper, I must say. A good end to an unexpectedly great day.